For those who have been searching far and wide for a professional and efficient skip hire company, Dial-a-Bin is not to be missed. Offering well over a decade of experience within this changing industry, we are happy to supply flexible waste management services to a growing number of clients. 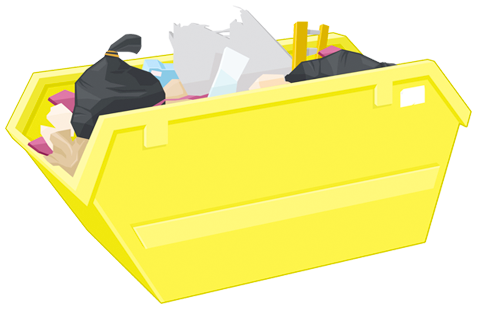 Some of the items which we provide include skips of numerous sizes, roll-on and roll-off containers, wheelie bins and many more. We are able to offer clients flexible services which are always based on the needs of the customer. Dial-a-Bin is aware that in this business, convenience is king. Thus, we are able to pick up our bins six days a week at your request, and because our units will delivered on schedule, you can remain confident that even the largest of construction projects will be addressed promptly. Thanks to our experience in the industry, we will provide a hands-on approach that is designed to determine the best ways to tackle your waste disposal issues. We are also environmentally conscious and are committed lowering the amount of waste, promoting recycling and reducing landfills throughout the United Kingdom. Should you wish to learn more or if you desire to employ our services, please do not hesitate to fill out our easy online contact form or call us on 01280 851081 for further details. Why hire a skip from us? Not sure if we cover your area? Give us a call on 01280 851081 or use our online coverage checker.